For centuries, marine species have moved around either by hitching ride on the hulls of ships or as stowaways in ballast water. In many instances, species have been deliberately introduced for aquaculture or other commercial purposes. Now, a national campaign is taking place to map where non-native marine species have invaded the UK coastline, and to help scientists understand the impact they are having on the coastal environment. The 'Marine Invaders' campaign will run September 8-11 and is part of the of the three-year Capturing our Coast (CoCoast) project, led by Newcastle University and funded by the Heritage Lottery Fund. Dr Jacqui Pocklington, CoCoast Project Co-ordinator, Newcastle University said: "Some non-native species that find their way to our shores don't always stick around. The conditions required for a species to remain, grow and reproduce need to be close enough to its home range for it to survive. For this reason only a fraction of the species that move about actually start a life somewhere new. "Of the species that do succeed, some have a positive effect – for example, they might become a new food source for existing species and increase the biodiversity of the marine environment." "Others thrive a bit too well and can become pests. These invasive species compete for resources and introduce new diseases. 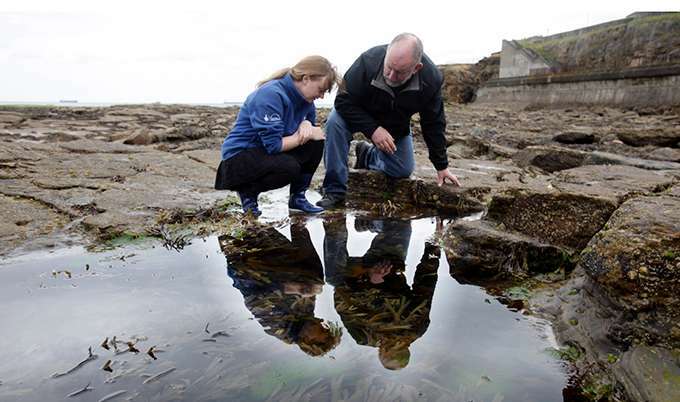 If we can map the non-native species around our coastline then we can get a better understanding of how they're affecting the marine environment." One example of an invasive marine species is the seaweed, Sargassum muticum, commonly called wireweed. This is thought to have arrived in UK waters in 1971 and now has spread as far as the Isle of Skye. It is thought to be responsible for displacing local species by starving them of sunlight. Another invader is the Chinese Mitten Crab, which is believed to have been introduced by ships emptying their ballast water when they reached port. The crab is native to China and Korea, but has been spotted in the UK in locations as widespread as the estuaries of the Thames and the Clyde. Concerns have been raised about the speed it is establishing itself and the damage it can cause to fishing nets and infrastructure. Dr Nova Mieszkowska, Marine Biological Association of the UK Research Fellow says: "Non-native species can have both positive and negative effects on local marine communities that they invade and colonise. We still have much to learn about how non-native species affect the ecology of our shores, and this campaign will help to fill this knowledge gap." 'Marine Invaders' is open to the public, all ages, and no special training is required to take part. Participants can visit the CoCoast website, where a list of habitats and non-native species will be provided. Volunteers can then choose which habitat they wish to visit – sandy beach, rocky shore or ports and estuaries - and choose a species to search for. An identification card will be available to download, print and take to the shore to help with their search, which the CoCoast team say should take around 15 minutes. Records can be uploaded to the CoCoast website, and shared on Twitter @CapturingRCoast. Regular CoCoast volunteer Dave Bell, from Cullercoats, who will be taking part in the Marine Invaders campaign, said: "I'm taking part because I am concerned with the interaction of the invasive species with the existing local inhabitants. The arrival of non-native species has the potential to disrupt the natural balance of our coastal eco-system." Dave, 60, who is also a Captain of the Tynemouth Volunteer Life Brigade in his spare time, is one of the original CoCoast volunteers and goes out every month to record the marine life he sees on the coastline around Cullercoats. "Being part of the CoCoast initiative is good fun," he added. "You don't need to have any scientific background. It's just a great way to get out and meet new people, and the possibility of finding something unusual in the process is a bonus." The CoCoast partnership involves Hull, Portsmouth and Bangor universities, the Scottish Association for Marine Science, the Marine Biological Association of the UK and the Marine Conservation Society. Along with Earthwatch Institute, the Natural History Museum, Northumberland Wildlife Trust, the Centre for Environment, Fisheries and Aquaculture Science (Cefas) and the North West Costal Forum.